If your text could talk, what tone would it be using? Fonts are basically the visual tone for your company and choosing the right font for your logo and graphic designs can be an incredibly overwhelming and tedious process. While it’s easy to select a few that you know you don’t like, it often seems that there are entirely too many choices with minimal differences. How do you choose? Does it even matter? The truth is, the font you choose to represent your brand influences how your message is interpreted and how your overall brand is perceived. Font can even induce emotions in the reader. Check out this example. How do the two different fonts make you feel? There are thousands of different fonts to choose from; however, they can be classified into a few different categories. Serif- Serif fonts have little “feet” or lines attached to the ends of the letters. They’re generally viewed as more serious or traditional. Sans-Serif- The literal translation of this is “without serif”- so these fonts do not have the little feet on the ends of the letters. They are generally viewed as more modern or simple. 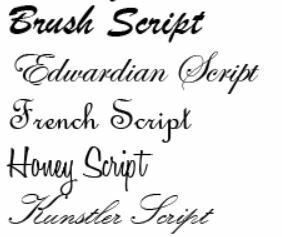 Script- These are fonts also known as cursive or handwritten. The letters ae generally connected. Script fonts vary from very formal and elegant to fun and casual. Decorative/Display- These fonts are designed specifically to capture attention. They’re often more unusual and should be used minimally for a specific purpose, so they aren’t ideal for lots of text. What qualities or characteristics do I want my design to communicate? What is my brand’s personality? Is it more serious, playful, casual or elegant? What is the context? Will the text be very small (like a business card) or extensive (like a blog article)? If so, it should be easy to read and non-distracting. What media is it for? If just print, then your font search will be easier. But, if needed for Web, you’ll need a font that is available and appropriate for all usages and performs well in all environments. Most fonts have a distinct personality or mood- serious, casual, playful, elegant. It’s important to consider that when you are combining several fonts into one logo or advertisement you make sure that the font matches the purpose of the design. 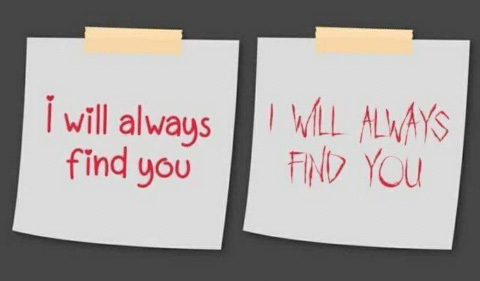 When combining fonts, consider the “opposites attract” fact. Pair a strong font with something more neutral so the overall effect isn’t overwhelming, and always make sure that all fonts chosen are easily readable at the actual size it will be displayed. One easy combination? Mix a serif and a sans-serif font. They tend to work well together, particularly in contrasting sizes. Another safe bet is to use fonts from the same “family”- they have the same font name but varying weights (light, regular and bold), styles and cases (upper, lower, small caps). 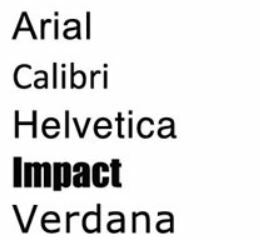 Take the font “Arial” for example- it has seven different versions in Microsoft Word! 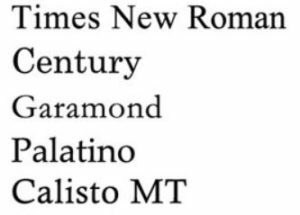 Choosing fonts is a trial and error process and may require multiple attempts to get it exactly how you’d like it. Don’t be afraid to experiment and try something you wouldn’t normally- the result may surprise you! If you were a font, what would you be? Take this quiz and find out!